A Tarsal Coalition is a congenital condition that affects the bones of the foot in children and adolescents. Congenital means that the condition is present at birth and occurred during fetal development. A tarsal coalition occurs when the bones of the feet fail to separate during fetal development. This leads to a problem in the foot that can be painful. It also may cause a stiff, flat foot. The condition is not common, but it is not rare. About one in a hundred people, 1% of the population, have a tarsal coalition. 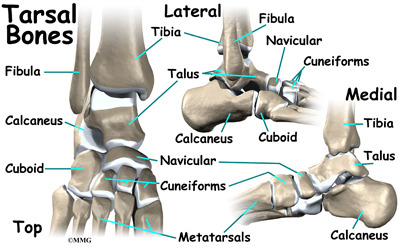 The tarsal bones are the seven bones that make up the heel and the midfoot. The metatarsals and the phalanges are connected to the tarsals and form the forefoot. A tarsal coalition can affect any of the tarsal bones; all but two types of tarsal coalitions are extremely rare. 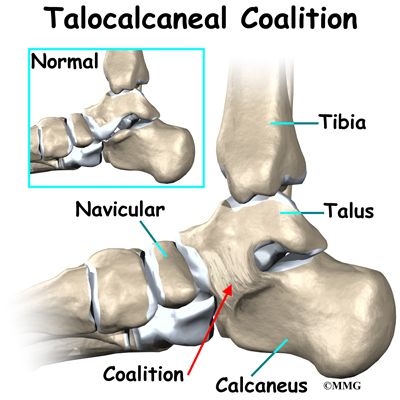 The two most common types are the calcaneonavicular coalition and the talocalcaneal coalition. 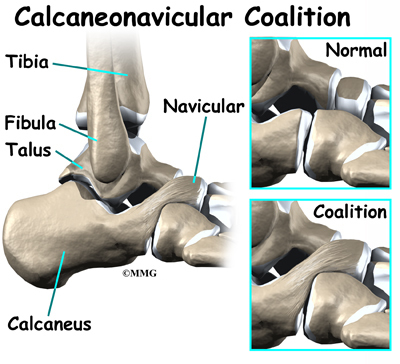 The calcaneonavicular coalition describes a failure of separation between the calcaneus and the navicular, while the talocalcaneal coalition describes a failure of separation between the calcaneus and the talus. Sometimes the conditions are also called calcaneonavicular bar and talocalcaneal bar. The term "bar" refers to the abnormal "bar of bone" between the two bones. There is not a fully formed bar of bone between the two bones of the coalition in every case. The coalition or "bar" between the two bones can be made of bone, cartilage, or fibrous tissue. Each of these types represents a different degree of attachment between the two bones, with the stiffest being bone and the most flexible being fibrous tissue. During the nine months of pregnancy, the fetus undergoes remarkable changes. In the skeleton, these changes include the separation of each individual bone in the body from one mass of bone material. In some cases, this process is flawed. A tarsal coalition occurs when this type of failure to separate occurs in the tarsal bones of the foot. Tarsal coalition is genetic, meaning that it runs in families. In addition it is an autosomal dominant genetic condition. This means that if you have one parent with the disorder, it is highly likely that you will inherit the disorder. 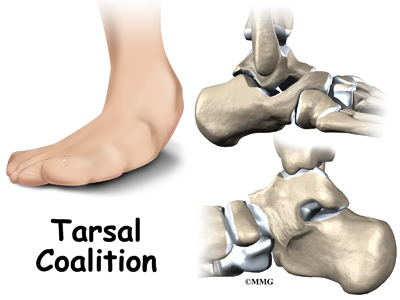 Tarsal coalition becomes a problem because it affects the way the bones of the foot move as we walk. The foot is an incredibly complex structure. To function correctly, all of the bones of the foot must move in relationship to each other. If the movement between two bones is abnormal or non-existent, the motion in other joints is disrupted. The abnormal motion increases the stress on other joints. Over time, this leads to wear and tear on those joints. Finally, it leads to pain. In the past, this condition was called peroneal spastic flatfoot because doctors thought that the flattening of the foot was associated with spasms of the peroneal muscles that run along the outside of the calf. This is probably not a big part of the problem. A tarsal coalition does cause the foot to be flat and stiffer than normal. The primary symptom caused by a tarsal coalition, no matter whether it is a calcaneonavicular coalition or a talocalcaneal coalition, is pain. Pain is usually located on the outside of the foot just below the fibula. 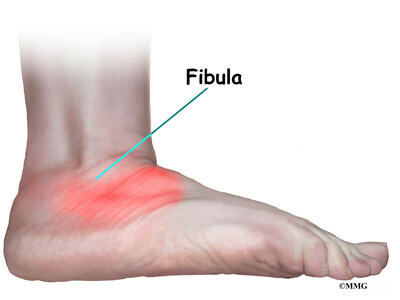 The fibula is the large bump on the outside of the ankle. This painful area is called the sinus tarsi. Most problems that affect the joint between the talus and the calcaneus, the subtalar joint, seem to be felt in this area. When the condition becomes more advanced, other joints can be affected. 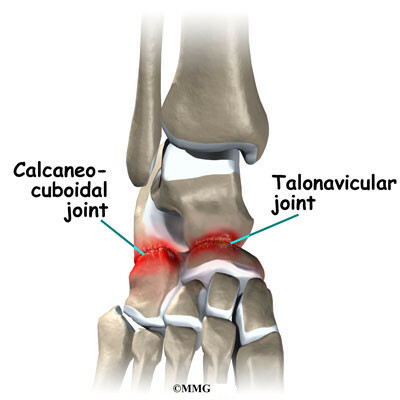 The two most common joints are the talonavicular joint and the calcaneocuboid joint. If these joints are affected, pain may be felt on the top of the foot and on the outside of the foot. The history and physical examination help to make the diagnosis of tarsal coalition. The doctor will need information about the age and activity level of the child. The doctor will watch the child walk and pay particular attention to the way the feet move during gait. Finally, examination of the feet is necessary to locate areas of tenderness and look for restriction of motion in each of the joints in the foot. X-rays are helpful in diagnosing tarsal coalition. Special views have been developed to look specifically at the different areas where the coalitions occur. X-rays also show the other joints of the foot. This allows the doctor to determine how much wear and tear has occurred in other joints. This information may become important later in trying to decide what treatment is best to recommend. The Computed Tomography (CT) Scan is the gold standard for making the diagnosis of tarsal coalition. The CT scan is a special type of x-ray test where a computer is used to create slices of the skeleton. In some cases, where the coalition is made of cartilage or fibrous tissue, a Magnetic Resonance Imaging (MRI) scan may be necessary. The MRI scan also makes slices of the foot but it shows soft tissue much better than the CT scan. The MRI scan uses magnetic waves rather than x-rays. After making the diagnosis, your doctor may recommend placing the foot in a walking cast or a brace from the knee to the toes for two to four weeks. The purpose of the cast is to place the joints at rest and allow the inflammation and irritation to decrease. This reduces pain. Once the pain has stopped, the cast is removed and special orthotics are custom made for everyday use. This orthotic can be worn inside a normal shoe. 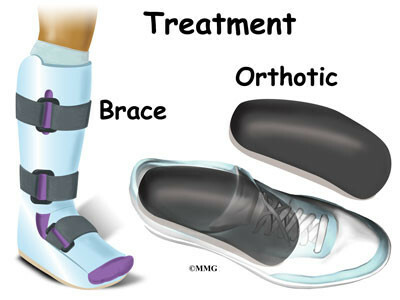 The orthotic supports the foot, reduces the abnormal motion and reduces the pain with walking. If this is successful, this may all the treatment that is needed. When the condition continues to be painful despite non-surgical treatment, your doctor may recommend surgery. 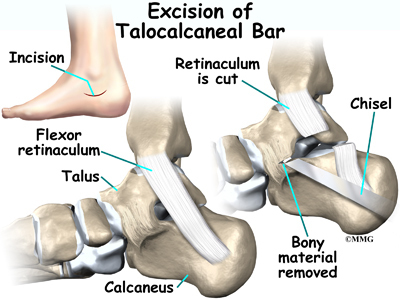 Surgery for tarsal coalition falls into two categories: 1) surgery to remove or excise the bar and attempt to restore normal motion between the two bones or 2) surgery to fuse the affected joints together solidly. As a general rule, excision is more likely to be successful in the younger child. In the older child or adolescent, a fusion may be required. Once the surrounding joints have become excessively worn, or degenerative, restoring motion may not be enough to stop the pain. The older the patient, the more likely this has occurred. 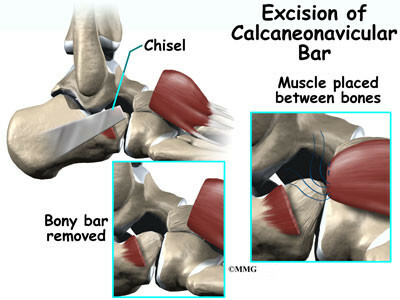 When the coalition occurs between the calcaneus and the navicular, excision can be highly successful. To perform this procedure, an incision is made in the lateral side of the foot immediately over the sinus tarsi. A muscle called the extensor digitorum brevis is detached from the bone and moved out of the way. The surgeon will then cut out the bridge of bone between the calcaneus and the navicular. 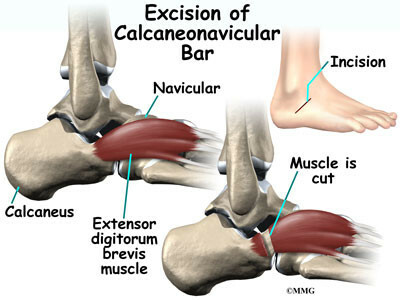 Once all of the bone connecting the calcaneus and the navicular is removed, the empty space is filled with the extensor digitorum brevis muscle. The muscle is held in place with sutures. Placing the muscle between the two bones prevents the bone from growing back and recreating the bar or coalition. The skin is sutured together and the leg is placed in a cast or brace. 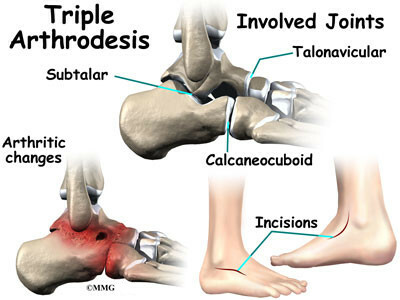 When the coalition occurs between the talus and the calcaneus, excision is less predictable. To perform this procedure, an incision is made in the medial side of the foot under the medial malleolus. 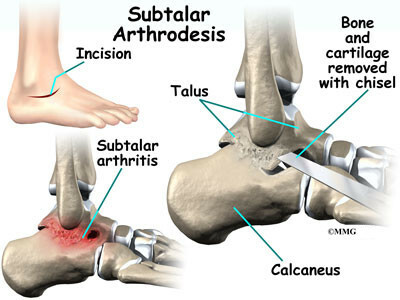 The surgeon will then cut out the bridge of bone between the talus and calcaneus. 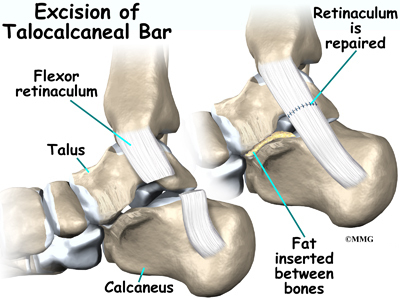 Once all of the bone connecting the talus and calcaneus is removed, the empty space is filled with a piece of fat tissue taken from the lower leg. The fatty tissue is held in place with sutures. Similar to placing muscle between the two bones, the fatty tissue prevents the bone from growing back and recreating the bar. The skin is sutured together and the leg is placed in a cast or brace. 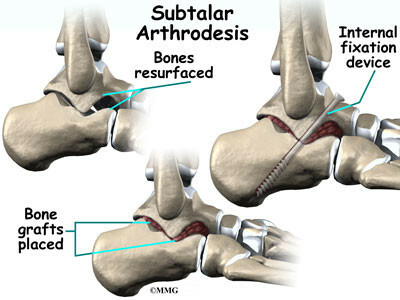 A fusion, also called an arthrodesis is a surgical procedure that is usually done when a joint becomes worn out and painful. The purpose of a fusion is to stop the motion between two or more bones. The procedure is done by removing the cartilage that covers the joint surfaces and allowing the bone surfaces to heal together or fuse as one bone. Two types of fusions are commonly used to treat tarsal coalitions. A subtalar arthrodesis fuses the talus to the calcaneus. This type of arthrodesis is commonly used to treat the talocalcaneal coalition that is too advanced to consider an excision. This type of arthrodesis is used when the joints in the rest of the foot are still in good shape and do not seem to be causing pain. 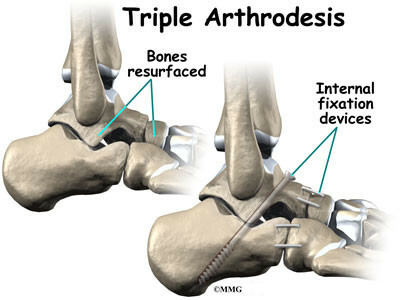 A triple arthrodesis fuses three bones together: the calcaneus, the navicular and the cuboid. This type of arthrodesis is commonly used to treat any tarsal coalition that is too advanced to consider an excision and the condition has affected other joints in the foot. This type of arthrodesis is commonly recommended in the older patient. It may also be recommended if an excision has been tried and failed to relieve pain. When a cast is used to rest the foot, most children learn to walk in the cast fairly rapidly. No special training is needed. Once the cast is removed, you may need to see an orthotist to have a pair of orthotics made. Orthotics are special inserts for the shoes to support the foot. These fit inside the shoe and do not require any special training to use. After surgery for excision of the tarsal coalition, a large bandage is applied to the foot. Some type of cast or brace may also be used. Weight bearing can usually be started in a few days, as soon as the pain and swelling subside. Since there is no bone to heal together, activity can usually advance as tolerated. A fusion is somewhat more involved. When a fusion has been performed, the bones will need to heal together and fuse. Screws or metal pins may be used to hold the bones together as they heal. A non-weight bearing cast or brace is usually applied. Weight bearing may be delayed up to six or eight weeks to make sure that the fusion is healing and the bones are showing satisfactory healing on x-ray.